July 7 is the 188th day of the year(189th in leap years) in the Gregorian calendar.There are 177 days remaining until the end of the year. 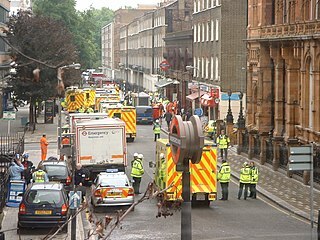 The 7 July 2005 London bombings, often referred to as 7/7, were a series of coordinated terrorist suicide attacks in London, England that targeted commuters travelling on the city's public transport system during the morning rush hour. Year 1124 (MCXXIV) was a leap year starting on Tuesday of the Julian calendar. Year 1456 (MCDLVI) was a leap year starting on Thursday of the Julian calendar. Year 611 (DCXI) was a common year starting on Friday of the Julian calendar. The denomination 611 for this year has been used since the early medieval period, when the Anno Domini calendar era became the prevalent method in Europe for naming years. Eudoxia Epiphania was the only daughter of the Byzantine Emperor Heraclius and his first wife Eudokia. She was born at Constantinople on the July 7, 611 CE, baptized on August 15, and crowned October 4 of the same year. Year 984 (CMLXXXIV) was a leap year starting on Tuesday of the Julian calendar. Crescentius the Elder was a politician and aristocrat in Rome who played a part in the papal appointment. Year 1021 (MXXI) was a common year starting on Sunday of the Julian calendar. Saint Æthelburg, known as Ethelburga, was an Anglo-Saxon princess, abbess and saint. Saint Felix of Nantes (514-584) was a 6th century catholic Bishop and Saint of Nantes, France. ↑ Iōánnīs Spatharákīs (1976). The Portrait in Byzantine illuminated manuscripts. [Mit Stammtaf.]. Brill Archive. pp. 19–. ISBN 90-04-04783-2. ↑ Mark W. Harris (31 August 2018). Historical Dictionary of Unitarian Universalism. Rowman & Littlefield. pp. 311–. ISBN 978-1-5381-1591-6. ↑ Masuzyo Chakwe. "Zambia's Florence Nightingale". pressreader.com (archived). ↑ Isabelle Wesselingh (2005). Raw Memory: Prijedor, an 'ethnic Cleansing Laboratory'. Saqi. p. 230. ISBN 978-0-86356-528-1. ↑ Philby, Charlotte (12 June 2010). "My Secret Life: Jeremy Kyle, chat show host, 44". The Independent. Retrieved 24 May 2018. ↑ Sevyn Streeter Biography. Retrieved February 3, 2013. "Born July 7, 1986, to Tim and Karen Streeter in Haines City..."
↑ Mheshwari, S Uma. Thrippadidaanam. Mathrubhumi Books. pp. 41–53. ISBN 978-81-8265-947-6. Wikimedia Commons has media related to July 7 .